Do you like old Macks? Someone over at local construction concern CCI sure does. I’ve come across a few of their site trucks at various projects this summer that I think you might enjoy. 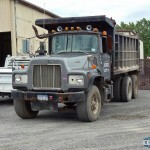 The one below is busy hauling broken concrete from a road rebuilding project. Plenty of action at this site with at least four or five dump trucks of this age hauling material to a temporary dump site. I only had a few moments to spend on the scene but I hope to return soon. This one was spotted at a local manufacturing expansion project helping with site work. It was partnered with an identical unit that I didn’t bother to take a photo of because it was raining and I was afraid of melting. And more! Nice offset on that grey one. Sounded good at idle too. 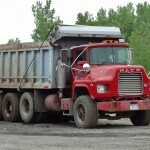 This entry was posted in On the Job and tagged cci, mack dump trucks. Bookmark the permalink.